The ad campaign is just beginning to roll out but in the meantime, here’s some road trip scenics from our trip. It’s a beautiful province with wonderful variety. Thanks again to ATB for hiring us! We’re looking forward to the campaign in full swing soon. Even though we had our sneaking suspicions that 16 degrees was more of a rule than an average, we were proved wrong when it hit 24, and the bright sunny sky followed us around the Loch for the second day in a row. Adrian is the designer of the Exhibition at the Loch Ness Centre, and lead man on research organization, the Loch Ness Project. Basically, if you have a question about Loch Ness, Adrian probably has an answer, or at least a scientific explanation of some sort. When it comes to his own personal theory on Nessie, he says he has a ‘soft spot’ for sturgeon (despite the fact that there isn’t a fresh water variety). Though locals are quick to dismiss Adrian as a Nessie naysayer, it’s obvious Adrian is a big proponent of all things Loch Ness. Including tourism. Roughly 200,000 Nessie-hungry tourists pass through his doors each year. Some say most leave the exhibition as non-believers. Ironically, the adjoining gift store featuring a giant wall of stuffed Nessies seems to be making a swift buck. After our time with Adrian, we headed to Dores for a quick bite and a chat with Nessie Hunter Steve and the friendliest man in Dores, Ronnie (thanks for the Turkish Delights). Our next stop of the day is becoming a familiar one – Fiddler’s in Drum. But this time, instead of drinking the whisky, we were shooting it, as well as owner and resident single malt enthusiast, Jon. When Jon talks about whisky, his enthusiasm spills over to all within earshot. A big fan of Port Ellen (a mothball distillery I’m told) and most of the northern highland single malts, Jon seems to be on some sort of mission from above to spread the single malt word. And we’ve certainly heard the good news. When we asked Jon about Nessie, he cunningly turned the conversation back to whisky. He’s never seen the monster, nor have any of his staff (it says as much on the menu). But the official Fiddler’s logo does feature a cartooned version of the beast. Anything to draw the world in for a dram. We finished our day back at the Clansman Hotel, in the fine company of Willie the Rat (which I feel strange referring to him as such, since he’s been anything but). Smartly dressed in a ‘McLeod of Skye’ kilt and dark socks, our Willie was ready to go. 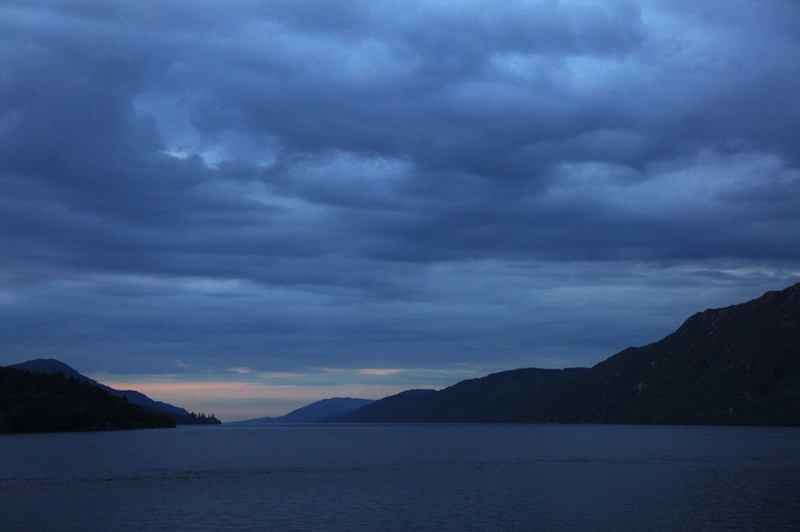 Lucky for us, the sunny sky had made way for a moody cover of cloud over the Loch by early evening. The lighting was made to order. And Willie looked as if he owned the place – proud as could be. We’re finishing up the day back at Willie’s bar, downloading photos, writing our blog, and listening to some of the best stories to be heard around the Loch. On account of a late night dram at the Benleva Hotel (thanks Joe! ), we had a wee bit of a sleep in. And it was lovely. But after a quick breakfast (still considered breakfast if you’re on Newfoundland time), we headed off in search of Nessie Hunter Steve Feltham in Dores. But first, Highland cows. So up into the Highlands above the village of Dores we went, trying to locate a spot that Ronnie had told us about the day before. It was a beautiful, sunny day and though we were constantly flanked by sheep and goats along the winding country road, no cows in sight. 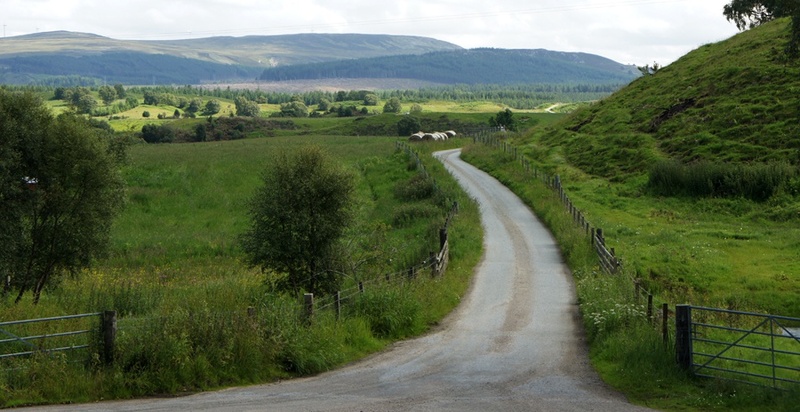 This is probably a good time to mention that some of the roads around the Loch (and up in the Highlands) are of the single tract variety. Meaning, you have to stop at ‘passing places’ to let oncoming traffic by and avoid the always messy head-on collision. So there we were, faced with an approaching car, and no passing places in sight. Being the polite Canadians we are, Michele decided to pull off to the side of the road into a meadow. Make that a meadow ditch. We tried everything. Pushing from the front. Pushing from the back. Gunning it while two people stood in the trunk surrounded by camera equipment in order to strategically weigh it down. We even ‘borrowed’ a few fence posts to put under the groundless wheel. After many failed attempts to solve the ‘rental car in a ditch somewhere in the Highlands’ situation, three brawny Scotsmen on bicycles miraculously appeared and proceeded to push the car back onto the road. Needless to say, we were very grateful. And we put the ‘borrowed’ fence posts back where they belonged. Obviously, after all that drama, we were in need of a pint, so back to the Dores Inn it was. We bumped into Ronnie once again, and then we all made our way to see Steve Feltham. We found Steve sitting on the front deck of his converted mobile library / home making Nessie figurines (and sharp ones too) out of fimo and beach rocks. So we walked up and introduced ourselves. But Steve already knew we were coming, thanks a few phone calls from around the Loch. Steve calls himself a Nessie Hunter and he’s quite serious about it. Meaning, he’s dedicated the past twenty years of his life to the unusual pursuit. So it made sense that Steve was very receptive to ours. After all, it was a mutual one. Steve became fascinated with Nessie after a trip to Loch Ness at the age of seven. Although he never forgot it, like most people, he grew up and got a job. Several actually. But he referred to one in particular as soul destroying (installing home alarms). He reached a point where two weeks a year searching for the monster wasn’t enough. So he decided to pack it all up and make it a permanent gig. Steve says he’s stopped searching for some pre-historic dinosaur. But he adamantly believes there is ‘something’ in the Loch. And he has some interesting theories, like perhaps Nessie is some sort of wels catfish (catfish on steroids). He says it can’t be a giant eel on account of how it moves in the water – like a snake. Anyone who knows anything about Nessie knows that she moves more like a whale (up and down, not side to side). He also says that the Loch has a sort of ‘energy’ that draws people in. An energy you can’t explain, but you can’t ignore. And whether you come for the monster, or for something else entirely, people keep coming back to Loch Ness. Some, like Steve, never leave. And if that’s not magical, I don’t know what is. We photographed Steve just outside his ‘Nessie-ery Independent Research’ unit on Dores beach. The day began ambitiously enough. It was our last morning in Drum, and Michele and I wanted to take advantage of the fact that we were only a few miles from a castle. So we ran there and back. The view of the Loch below was simply perfect. And we felt a smidge better about all the chips, toffee, puddings, pints, and whiskies we’d been so fortunate to taste. Today we were moving home base from Drumnadrochit to Fort Augustus just a half an hour down the road. So we packed up, waved goodbye to our bunk beds, and off we went in search of, you guessed it, Highland cows. But unlike previous attempts, today we struck Highland cow gold. First, near Drum, and then again in Invermoriston. They were so adorable, I instantly felt terrible about all the burgers, steaks, prime ribs, and meatballs that had come before them. Oddly, both locations involved standing in very old graveyards to get the money shots. I couldn’t help but think there are worse places to end up. After the cows (who incidentally refused to sign the model release forms), we made our way to Fort Augustus and checked into the Lovat Hotel. The Lovat is pretty fancy pants compared to our old digs but we quickly (and happily) acclimatized. We also spent a few hours basking in the working WiFi and took the opportunity to touch base with home. We noticed a lady working at the bar who looked strangely familiar. Her name was Briony and we’d seen her a few days ago at the Dores Inn. We told Briony what we were up to and before we could order another round, a few other kind souls from the Lovat had appeared to offer up assistance, names of potential recruits, and places (read pubs) we could visit. All in all, a very warm reception to Fort Augustus. We enjoyed a meal and a few whiskies at Bothy’s pub near the canal, where we bumped into Graham from Foyers again (small Loch). Then we headed home for an early night and some Jerry Springer, which is somehow funnier in Scotland. Tomorrow looks like it’s going to be a busy day as we have high hopes of photographing several of our new friends. Wish us luck. And lighting. We travelled the five miles down the road to the Clansman Hotel and within minutes we were sitting there with Willie, our mouths hanging open, hardly believing what we were hearing. Willie is a born storyteller and he told us the story of his father Ian who had seen something “most peculiar” one day in June, 1965 while fishing the loch with his buddy. Willie described the details of what his father saw that day. They didn’t call it a monster, but they knew it was something that travelled against the current. It either had to have a motor, or it was some type of animal. According to Willie, his Dad and several other independent witnesses saw ‘something’ in the water that day. They all watched it for over fifty minutes. When Ian’s story went public, he didn’t speak of it for a very long time. As you can imagine, the ridicule would soon follow after a report of seeing something out of the ordinary, especially for a local policeman in the 60s. We were so wrapped up in Willy’s story that we ran out of time to photograph him, but we’ll try again tomorrow. The rest of our day was spent much like the others: searching for the Nessie researcher from Dores. He’s proving to be as elusive as the monster. However, we did hear a story from a local about how Steve had somehow managed to put a piano in his tiny trailer with a custom built add-on. The funny part is that he doesn’t even play piano. We can’t wait to meet him. The local with the piano story was a genuine guy named Ronnie. A few seconds after meeting him, we were in his car travelling the narrow roads in the area on a personal tour. First, he took us to a tucked away castle in the woods, and then way up in the Highlands to marvel at a stunning view of the Loch, which was encased by a seamless backdrop of mountain and cloud. The stories flowed and we learned tons of the local history. After a quick bite of lunch at the Dores Inn, we made our way around the south end of the loch to meet up with Malcolm who we promised to photograph yesterday. We keep our word, shared a pint and drove back to Fiddler’s (our Scotland office). We’ve given Terri a bit of a break from writing today as she, along with us, is still absorbing all that Willie the Rat had told us. Hopefully tomorrow we’ll meet up again and perhaps he can send us in the next direction. Today, we met a believer and he’s starting to make believers out of us too. 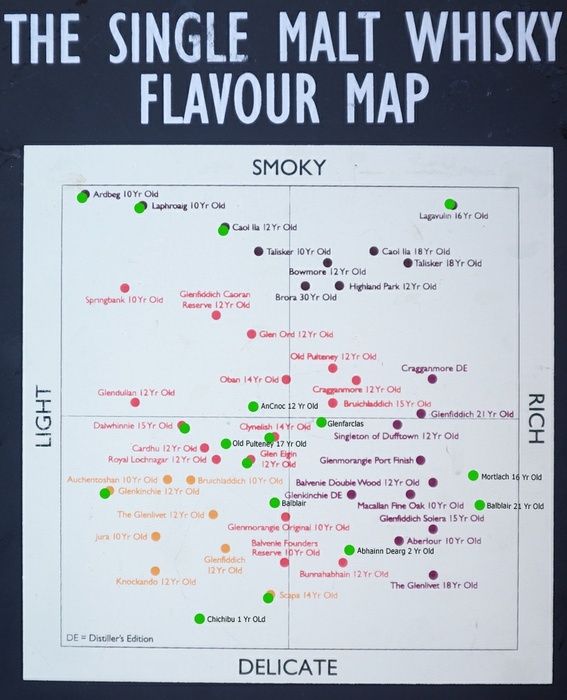 Whisky tasting to commence soon… we’re exploring our way across the whisky map. The green dots on the map are the ones we’ve tried so far. Roth and Ramberg ask "is it really all craaaapppp?" It isn’t every morning you start off at a castle but this was one such morning. Urquhart Castle is just a few miles down the road from Drum. Its first known visitor was Saint Columba more than 1400 years ago, though I doubt he came to see Russian swimmers. After a quick scan of the throngs of tourists, we spotted the Russians (well, tiny Russian specs) on the other side of the loch and watched with amazement as they swam their way across in nothing but brightly coloured speedos and tanned skin. It was an incredible sight. Upon reaching the shore, one particularly vocal guy with a thick Russian accent pronounced, “I love Loch Ness.” He must have. I was surprised how cavalier they all seemed about the potential for impending doom, what with a supposed monster living in the loch. But after training in Siberia, I guess this was their version of the finger. After all the international aquatic excitement, we headed south to Dores, where you can find the loch’s only beach and full time Nessie researcher, Steve Feltham. We’ve read about him, heard about him from the locals, and couldn’t wait to meet him. But, Steve wasn’t home in his converted mobile library / home / research unit behind the Dores Inn, so lunch it was. We made our way to Whitebridge (and straight into the pub) to find a friendly group of locals enjoying their Sunday afternoon pint. Of course we joined them. Before the empty glasses were laid down, we had a brand new recruit in Malcolm MacLeod, Malky for short. Malky took us to his home, which is new by Scottish standards, just 9 years old. He’d built everything himself, as well as an aviary for his birds. I couldn’t help but think of Jack Duckworth on Coronation Street. Malky was incredibly kind and was our first official non-believer. The Scotsman was adamant that all this Nessie business was, and I quote, “Crrrraaaaaaap!” After a grand chat, and an enlightening debate, there was still no stopping the rain. So we bid Malky farewell and would come back to take his photograph and enjoy more of his whisky on a dryer day. Michele, now a Scottish Formula 1 driver, made it back to Fiddler’s for last call with literally not a minute to spare. And thanks to her speedy skills, we bumped into Willie Cameron, son of the late Ian Cameron. Ian holds the record for the longest Nessie sighting in 1965. And much to our delight, Willie was going to tell us all about it tomorrow. Holy ‘crrrraaaaaaap’. Our first real piece of evidence. It was like monster research Christmas. After a lengthy sleep (jet lag induced, not booze), we headed out in search of Nessie, or those who may have encountered her. It was perfect timing, as the torrential rain was just stopping. We wandered into an interesting looking craft store (complete with sets of antlers missing heads) and met a cobbler lady who made her own clogs (which Dale has assured us he will purchase later). When we asked her if she’d ever seen Nessie, she said that we wouldn’t believe her if she had. After some reassurance, she told us how she’d seen ‘something’ 25 years ago on her honeymoon around Loch Ness. She was quick to point out that she couldn’t be sure what it was (perhaps a deer crossing the Loch?). We wondered if she felt she had to qualify her sighting story so that people wouldn’t think she was crazy. For the record, she wasn’t crazy at all. And, we put our money on Nessie versus the deer. Further down the road, we decided to stop and dip our feet in Loch Ness. Michele and I opted for bare feet. After a slight mishap atop a very slippery rock, Dale went for the whole shoe. It was colder than anticipated, and the lake itself as long as the eye could see. Although, it wasn’t really that wide. In fact, we later found out a Russian group of swimmers who were in the area were planning to swim across it on Sunday. For what reason I’m not sure. Maybe just because they can. We continued on around the southeast coast of the loch as the sun peaked in and out of the multiple layers of cloud above. It was obscenely picturesue. Parts of the highlands reminded me of Gros Morne, Newfoundland. And Michele did a magnificent job of navigating the tiniest of roads (on the left, of course). We landed in a place called Foyers, famous for its falls and stopped into the Waterfalls Café for a bite to eat. The place had a lovely deck on the front that from its high vantage point, gave a beautiful view of the loch below. We chatted with the owner of the café and the adjoining shoppe, Simon. Originally from Poole, Simon and his wife Jan retired here to enjoy the view. And what a view it was. We were fortunate enough to shoot Simon and his resident chef (and jack of all trades) Graham. All three had recently had a sighting from the very deck we were standing on. When we asked Graham if he thought what he saw was actually the famous monster, he answered, “It was either a lesser spotted black aquatic giraffe or Nessie.” And Graham seems to be a man in the know. We had a wonderful afternoon getting to know them, dogs Broody and Sophie, as well as the lovely Tasha who made a mean cup of coffee. But before we knew it, we were about to miss our reservation for dinner back at Fiddler’s in Drum so we hightailed it home for the night. Much to my delight (I’m using that word loosely), I was surprised with a birthday haggis (not kidding) complete with two very brave candles. It actually wasn’t that bad, if you like those parts of a sheep. We finished up the evening much like last night, with a dram of whisky for all. Not a bad way to spend your birthday. Rabbie Burns would totally approve. So, that ‘final’ dram turned into quite a few more with none other than the resident ‘champion of the Northern Highland whisky’ (Jon) and a visiting whisky maker (Marko) from Stornoway, Isle of Lewis. We lost count of the number of whiskies we tasted: some young spirits, some old, some that tasted like fruity gasoline, others like silky smoke, and others still that made you stomp your foot as it went down (true story). We learned that in order to be called a single malt scotch whiskey, it has to sit in a barrel in Scotland for at least 3 years and 1 day. And that whiskey spelled with an ‘e’ isn’t really whisky (hence all future whisky references will now exclude the lowly ‘e’). We learned about (and tasted) Japanese whisky and discussed the amount of information on their bottles. We were told how some distilleries up north ship their whisky to places like Glasgow to mature. And we talked about the importance of water (what makes it so peaty) – a passionate subject for our host. All in all, it was the biggest whisky lesson of our lives. One I’m sure not on the menu at any distillery tour in Scotland. After even more drams, the topics shifted slightly (and widely) to Scottish history, Canada, Newfoundland, Gaelic (the Gaelic word for ‘helicopter’ is in fact ‘helicopter’), whisky festivals in Glasgow (try not to get too drunk), MacDonell’s, MacDonald’s, Bonnie Prince Charles, the Seven Heads (that’s one well you don’t want to drink from), Glengarry, Hudson’s Bay, tea-spooning (has to do with making whisky, I assure you), Google Earth, Nordic-Germanic descent, Russians, French Canadians, Highland cows, lowlanders versus highlanders, Cuban food in Glasgow, haggis, blood pudding (made from cow’s blood, not pig’s, and very few with actual blood), and on and on and on. We were joined by a lady named Jenny who had gotten her car stuck on a rock somewhere on a country road looking for her dog. She was from a few towns away and had somehow made it to Jon’s to call for a tow in the middle of the night. She was a lovely lady who loved Canada and all the Scottish Canadian ties. Soon we couldn’t see the counter below for the bottles on top, all of which had amazing stories to tell. Much like the company we were fortunate enough to keep until the wee hours of the morning. We all met up in Edinburgh last night after a couple of red eyes across the pond. It’s a spectacular city, complete with bagpipers on virtually every corner (including a particularly talented fellow doing a killer version of Thunderstuck), statues, monuments, ancient churches, Braveheart impersonators screaming ‘Freedom’ and of course, one pretty incredible castle. I had the really tough assignment of wandering the historic streets all day as Dale and Michele made their way from Calgary. I know, poor me. We finally met up around 10 pm and headed out to grab some food. Little did we know, Scots eat early. Like, really early. But, we found a great pizzeria and tucked in. It wasn’t exactly haggis but it hit the spot. Then, since no one had slept since Canada, we called it a night to rest up for the long journey north to nessie in the am. After some seriously skilled left-side-of-the-road navigation courtesy of Michele (and one mean little GPS) we made our way out of Edinburgh and headed north to Loch Ness. We stopped in Kinross for lunch and couldn’t help but notice the throngs of twenty something girls in short shorts and long rubber boots. I mean, it is Scotland and everything, but this was ridiculous. The folks at the Salutations Inn filled us in that T in the Park (massive festival) was starting that day on an old airstrip nearby, hence the odd getups. After a double carb lunch of mac and cheese AND chips, we left the rubber boots behind and started off again. Of course, the best part of any road trip is the stops. And the malt whiskey distillery in Dalwhinnie was a sweet one. Dale and I had a sampler of four whiskeys (word to the wise: in Scotland, it’s not scotch, it’s whiskey) ranging from ‘screwed up face’ to ‘damn that was delicious’. We’d later learn that the pitcher of water was for diluting the whiskey to bring out the different flavours, not a chaser. Another 800 roundabouts later (Michele was as cool as a cucumber), we made it to Drumnadrochit, Loch Ness. It’s scenic, it’s quiet, and it’s all about two things: whisky and Nessie. In fact our hotel gift shop has nothing but Nessie: t-shirts, stuffed animals (an entire wall), tea towels, key chains, postcards. Oh, and a nice selection of kilts. My money is that Dale will be sporting one by the end of the week. We stopped into the fantastic Fiddler’s Pub for dinner and met owner and resident whisky expert Jon Beach. He chose a selection of singles malts for us to try based on what he thought we’d like. Eeirly, he was bang on. We all chowed down on Michele’s favorite dessert of Pavlova, a dreamy concoction of fluffiness and unidentifiable Scottish fruit, and sipped our whiskey like experts. Meaning, we knew what to do with the water. We’re back at our hotel now searching desperately for Wi Fi. Though the hotel assured us it was available, the fine print is that it’s only available in the bar. Which is now closed. I have a sneaking suspicion we’ll be blogging at Fiddler’s tomorrow night. Yeah, tough job indeed. In case you missed it, we had a contest to see who could come up with the best idea for our 2012 calendar. Whoever had the best idea would get to join us on the trip. Scotland. Home of Braveheart. The Bay City Rollers. Bagpipes. 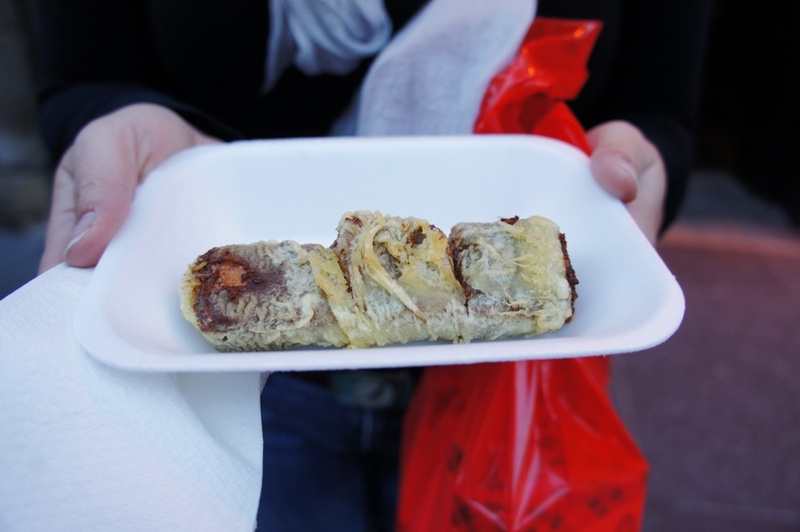 Deep fried mars bars. Irvine Welsh. Supremely masculine skirts. Haggis. Single malts. Groundskeeper Willie. The validity of this particular cryptid is all but written off. The fodder of crack pots and the semi afflicted. Minus a few souvenir shops, and the odd discredited photo, there’s not much hope. But what if it is real? Will it still be there? Was it ever there? What the hell is it anyway? And just who are the modern day purveyors of such nonsense? Are they sane? Are they mad? Do they still exist? Or are they as hard to find as Nessie herself? Sure, others have tried. Gaggles of others. Hoards, if you will. Let’s go to Scotland and get that one, indisputable piece of evidence that will make us legends. Or village idiots. Whichever. As luck would have it, there was a sighting of ‘Nessie’ in Inverness, Scotland just last week, the first sighting in a very long time. That bit of news has determined where our adventure will start. Will we see and photograph the monster? Probably not. 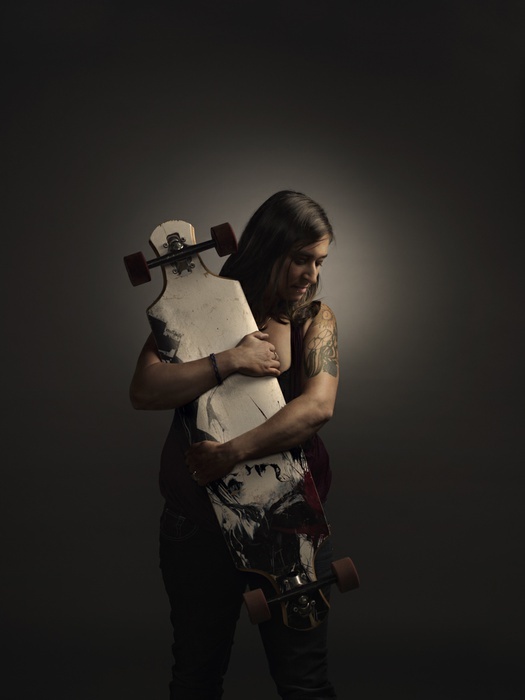 We will however, be photographing the believers, the naysayers and the just plain curious. We’re leaving tonight and meeting Terri in Edinburgh tomorrow night. By Friday July 8th we should be dipping our toes in the loch. Follow our DAILY BLOG over the next couple of weeks to find out how it all unfolds. Follow us on our website, blog, twitter and facebook. Summer is here… what does that mean for a photographer? Hopefully it means your clients will have the time and budget to do all those photographs that need to be done while the weather cooperates. This job was a perfect example of the client knowing exactly what they need and when they needed it to be done. We got a call from Bos in Toronto who had noticed our work in Applied Arts. They had a job for their agriculture client Syngenta, located in Calgary. 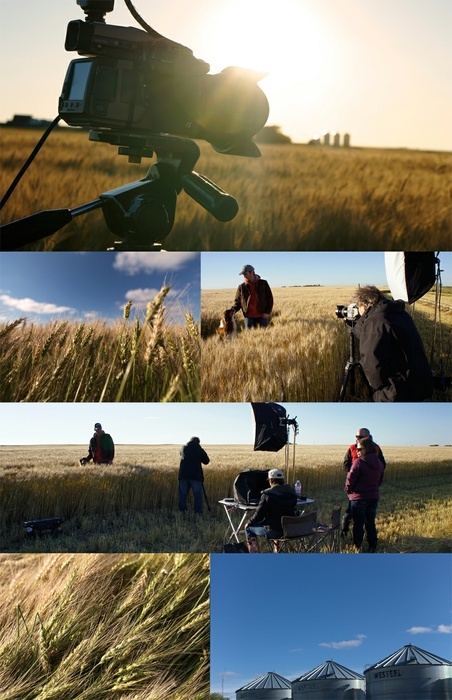 The client approved a shoot to be done at the end of summer when the wheat was at its peak height, just before harvest time. They needed a photograph of a young farmer in a field with his trusty dog by his side. We sourced the actor and tracked down a trusty, well-trained dog and then waited until the wheat was just about to be harvested. The night of the shoot was one of those perfect summer nights that all photographers dream of. We’ll be hopping in a plane and heading to Scotland with Terri Roberts. Terri works at Target Marketing in St. John’s, Newfoundland as a writer, as you can tell by her well-worded entry, which wooed us to pick hers. And just who are the modern day purveyors of such nonsense? Are they sane? Are the mad? Do they still exist? Or are they as hard to find as Nessie herself? We had a couple hundred entries submitted. We looked at every single entry and carefully considered each one as a possibility. We narrowed it down to a handful before finally choosing Terri’s proposition to search for the Loch Ness Monster. For the record, she screamed like a little girl when we called to tell her she won the trip. A huge thanks to everyone who made our calendar contest such a success. We appreciate that so many of you took the time to enter and to spread the word about the contest on social media. We haven’t booked the flights yet, but we’ll likely be heading out in July to start our escapades with Terri. We’ll be sure to update our blog regularly while we’re out pursuing the mighty Nessie. Follow along… we think we’re up for quite a feat. The PDN Photography Annual from New York selected our ‘fur burger’ shot done for the VaJayJay Monologues poster as a winner in the advertising category. A big thanks to Darcy Twarog from TAXI for bringing us in on this project… we had a lot of laughs while shooting.